Please note that this item will be shipped directly from Goddiva. This item does not ship internationally. Give your bridesmaids a reason to fall in love with a dress just like you did! This magnificently structured open back maxi dress is the ultimate bridesmaids dress for those warmer month weddings. In its enticing colour of lavender, your bridal party will be glowing with radiance. 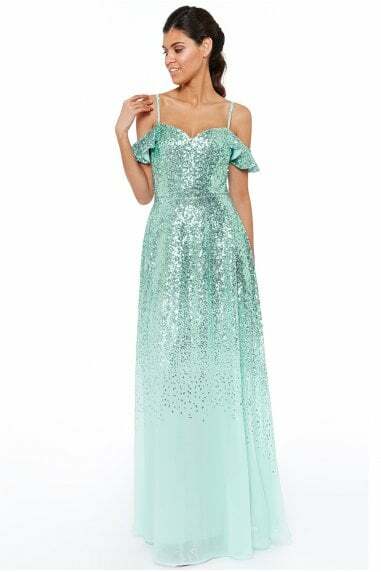 Not to mention its all over glistening sequins to make them shine just as bright as you on that special day. Its criss cross, open back finish and ruffle detail on the back, give this long-fitted bridesmaids dress a seductive and edgy feel. While its sweetheart neckline and thicker strap add a touch of class to the dress, giving your girls two looks in one. The best thing about these affordable styles is that your troop can wear them again for a number of functions they may have coming up.